The California gold rush of 1853 was too early for the Icelanders to participate. It also was on the wrong side of the North American continent. Passage to and from Iceland was still by sailing ships. It was unreliable, dangerous and expensive. Nearly twenty years were to pass before the wave of Icelandic emigration would bring Icelanders to Canada and, from there, to the United States. Twenty years earlier than the Icelandic immigration, Levi Strauss, a young German immigrant, crossed from New York to San Francisco . Responding to demand created by miners who needed tough clothing, he first used tough canvas that was supposed to be for tents and wagon covers. In 1873, while Icelanders were making their way to places like Kinmount, Ontario, Levi Strauss began to use the pocket stitch design and co-patented the process that allowed rivets to be put into Levi pants. 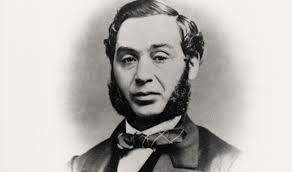 It’s the 150th anniversary for Levi Strauss because the company received its patent on the rivet’s procedure on May 20, 1873. By 1953, blue jeans were in style in Gimli, Manitoba and no blue jean was more coveted than Levi’s. They were the jeans I longed for, hungered for, wished for. Tight (I was skinny as a rail in those days), with a leather belt and cowboy boots, there were no pants that made me feel better. Of course, that was for daily wear. For dressing up, yes, we dressed up in those days, for dances and parties, we needed drapes, as wide at the knee as possible, as narrow at the cuff as possible. But those were for special occasions. Levis were for school, sports, work, and we didn’t pre-stress them. They got stressed because we lived in them. The girls, of course, treated their jeans differently. They were known to struggle into them, get into a bathtub of hot water, then get out so the jeans would shrink to fit their body. That made the boys want to take them off but since they were shrink-wrapped fit there wasn’t much chance of that happening. Put on like that they were as close to a chastity belt as you could get. How the girls did actually get out of them at the end of the day, I have never been able to figure out. There were other brands of jeans, I’m sure, but, if so, I don’t remember their names. It was the stiff denim, the boot cut, the studs, the stitched pockets that made a boy feel like a man and, even though there were no cowboys anywhere in sight, we tucked our thumbs into our belts and leaned against whatever happened to be handy. Oh, for that 22 inch waist once again, that sense that a pair of Levis made you look good, feel good and anything was possible.